FBI agents have conducted another search at the West Palm Beach, Fla. offices of the embattled eye doctor who has been a major campaign fundraiser for New Jersey's U.S. Sen. Robert Menendez. Tuesday's search was the second time this year that FBI agents and investigators from the Department of Health and Human Services (HHS) were seen removing boxes from the offices of Dr. Salomon Melgen. NBC 4 New York previously reported that the Justice Department is looking into Melgen and whether he fraudulently overbilled Medicare by $8 million. Officials have said federal investigators are also looking into whether Menendez, a Democrat, improperly tried to intercede with Medicare investigators on Melgen’s behalf. Menendez has said certain Medicare billing rules were unclear at the time and that he'd only reached out to officials to try to have them clear up the ambiguities. Questions have also been raised about whether the senator tried to help a company owned by Melgen win a port security deal with the Dominican Republic to screen cargo. That deal is estimated to be worth hundreds of millions of dollars. Melgen and Menendez deny they did anything improper and have repeatedly issued statements that the investigation will clear them of any wrongdoing. Melgen’s attorney, Matthew Menchel, issued a new statement Tuesday saying the FBI raid was in “retaliation” for Melgen filing a lawsuit against HHS over the ongoing billing issues with the department. "Unfortunately, today’s actions by the FBI are yet another in a series of inappropriate, overreaching steps taken by the government in their campaign against Dr. Melgen, his medical practice and his reputation," Menchel said. A spokesman for Menendez had no comment Tuesday. An FBI spokesman in Florida declined comment. 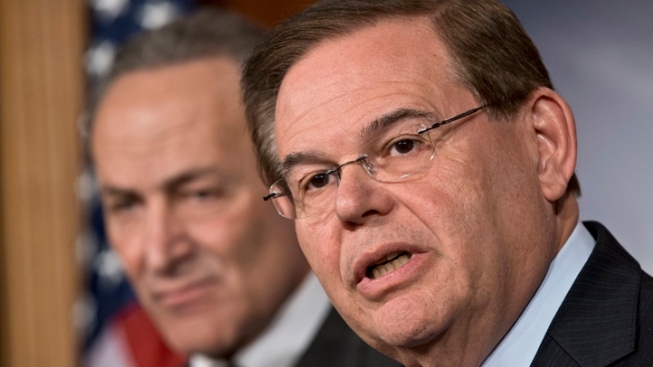 Earlier this year, Menendez announced he was paying $58,000 back to Melgen after news reports surfaced that the senator had taken free trips on Melgen’s private jet to the Dominican Republic in 2010. The senator said the costs of those trips have now been paid in full and have been properly reported. Melgen is Menendez's top political donor. Last year, Melgen's practice gave $700,000 to Majority PAC, a super PAC set up to fund Democratic candidates for the Senate. Aided by Melgen's donation, the super PAC became the largest outside political committee contributing to Menendez's re-election, spending more than $582,000 on the senator's behalf. AP and WPTV in West Palm Beach contributed to this report.